Impetuous Man’s identity is revealed! 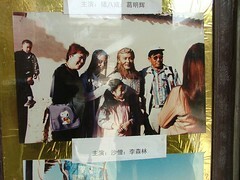 When my brother Jack and I were in northwest China about 18 months ago, doing research for Women of the Gobi, one of us took a photo of a poster outside a shop in Dunhuang. 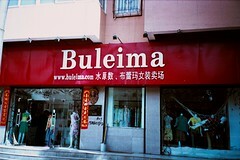 We thought it must be advertising some kind of Chinese Vlagra. I posted the pic here a couple of months ago, and it’s in my Flickr photostream. At the time, someone pointed out that the man looked like Penn Jillette from the magic/comedy duo Penn and Teller. ‘Meh,’ I said. 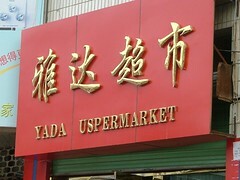 When I first arrived in China, I laughed at, and wrote down, every instance of strange English spelling and usage that I saw. I prowled the streets searching for wacky signage to photograph. But after a while, I realised that I didn’t have enough notebooks, or space on my camera’s memory card, to contain all the misshapen English around me. And my Chinese is pretty terrible (the way I said “One ticket to Jiuquan”, for example, sounded exactly like “Please point me toward the left-luggage office”; the bus-station staff were very amused), so it seemed kind of patronising of me to be chortling at Chingrish. And then, after a while, I stopped noticing it. Although I perked up when I saw this, mainly because that’s what you’d have to suffer from to fit into the clothes sold in this shop. This one also had me intrigued, mainly because of the agonised look on the woman’s face. I’m assuming it’s advertising some kind of Vlagra-type tonic. Perhaps. Update: How could I have forgotten this? Jack and I hired a taxi to take us out to some lesser-known Buddhist caves in the desert outside Dunhuang. A caretaker showed us a few caves and pointed out the faded seventh-century murals on the walls, which we duly admired. There were no other visitors, and we wandered around, enjoying a rare moment of quiet, past the caretaker’s hut and chickens, along a pebbly stream in a gorge behind the caves. 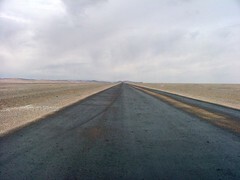 Then we drove back to Dunhuang, through desert that looked like this, in every direction. 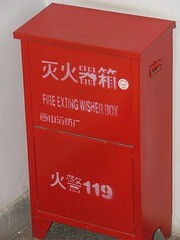 So you can imagine our surprise when we saw this. 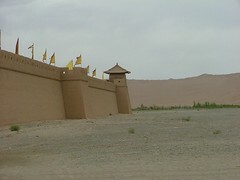 The Lonely Planet didn’t mention a fort outside Dunhuang, but this looked exactly like an ancient mudbrick fort, with crenellated walls and huge carved camels out the front. We couldn’t imagine what it could be. The driver indicated that we should go and have a look. On the way through the front gate we paid an entrance fee, and I tapped one of the stone camels, which turned out to be made of fibreglass. A good gust of wind could have blown it out into the desert. Brighter people than us might have worked out at that stage where they were, but we were still mystified. Were we in some kind of olden-days theme park, a kind of Dunhuang Pissweak World? 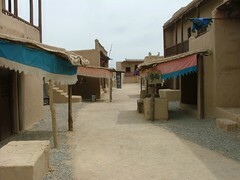 Inside were mudbrick houses, some with flimsy-looking upper stories. We peeked into a few rooms, one of which had some pictures on the wall. The pictures showed people with film cameras, and actors in costumes. And we finally twigged that we were in a film set. That would explain the rickety props; we liked the plastic skull hanging from a plywood gallows. We were most excited when we saw that one of the photos on the wall featured a version of our all-time favourite TV character, Monkey, known as Sun Wu Kong in China. So here’s a message for my friend Bec Chau, commissioning editor for Lonely Planet’s China guide: this place should be in the next edition!